Real estate appraisers in Colorado are required to be licensed. They are trained in Uniform Standards and must adhere to a Code of Ethics. It is important to note when an appraiser comes to evaluate your home s/he is required to look for and report specific deficiencies in your property. These deficiencies can be easily detected by homeowners and corrected prior to the appraiser’s arrival. The following is a list of the most commonly found deficiencies in a home. Use it to your advantage and avoid unnecessary stress! Missing/loose safety handrails on stairways or loose/damaged/missing safety railing on decks or retainer walls over 30″ high. 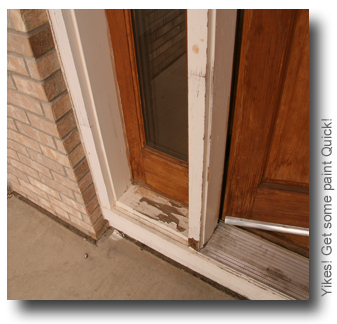 Loose/damaged floor covering and walks or driveways (Upheaval/settlement) that could cause injury by falling. (Local building codes preside, however, over 2″ is likely dangerous). Paint/stain peeling to bare surface; missing or damaged gutters or down spouts where drainage is marginally away from improvements; leaking plumbing or bath/shower tiles missing or damaged; holes against foundation that may allow water penetration (usually from pets); landscape drainage toward the improvements; missing/damaged/curling roof shingles or covering; free standing water or dampness is frequently evidence of poor drainage, leaking water pipes, or high water tables (seasonally)- May need electric sump pump; structural damage from any cause-usually expansive soils,poor drainage, or the combination. The appearance/existence of one or more of the above items may cause an appraisal requirement which, in turn, creates more expense and time delays. Solving these potential problems in advance will save both time and money plus enhance your property value.